You get off a 12-hour flight at some Asian or European or South American airport and turn on the iPhone. Instead of taking in what's there, you're flooded with e-mails. The media tells us we're lucky, but haven't we created a hell for ourselves? Reflections of a Business Nomad chronicles what I've seen & felt these past dozen years as an international consultant. Happy to tell you that the E-book is now available on Amazon.com and other providers. Clicking on reflections-of-a-business-nomad.com will also get you to the order page. 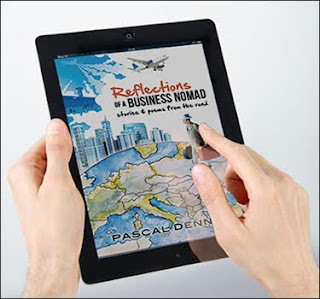 Reflections of a Business Nomad is also book about Leadership and Ethics. Should leaders read stories and poems? I hope so. Leadership requires imagination, empathy, and the ability to make sense of complex realities. The best leaders I know all read & reflect. The very best leaders are story-tellers. Travel is linear – one place, one landscape, one conversation at a time. Hyper-connectivity dilutes the intensity of travel. Multi-tasking hinders the development of personal connections to local people and places. So let's turn our screens off. Let's look around, let's talk to the cabbie, make friends with the bartender. Let's be present.